Harold Guskin is an "acting doctor" whose clients include Kevin Kline, Glenn Close, James Gandolfini, Bridget Fonda, and dozens more. 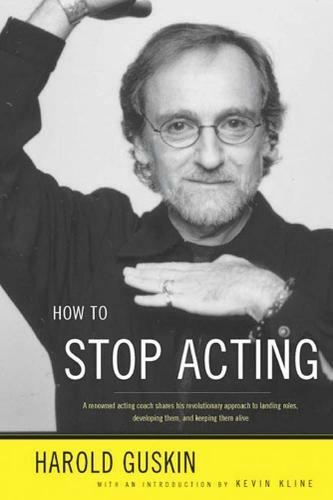 In How to Stop Acting, Guskin reveals the insights and techniques that have worked wonders for beginners as well as stars. Instead of yet another "method," Guskin offers a strategy based on a radically simple and refreshing idea: that the actor's work is not to "create a character" but rather to be continually, personally responsive to the text, wherever his impulse takes him, from first read-through to final performance. From this credo derives an entirely new perspective on auditioning and the challenge of developing a role and keeping it fresh, even over hundreds of performances. Drawing on examples from his clients' work and his own, Guskin presents acting as a constantly evolving exploration rather than as a progression toward a fixed goal. He also offers sound and original advice on adapting to the particular demands of television and film, playing difficult emotional scenes, tackling the Shakespearean and other great roles, and more. His book will find an eager and appreciative audience among novices and established actors alike.